The invasive "jumping worm" (genus Amynthas). Jumping worms (Amynthas spp.) are an invasive group of earthworms from Asia. They were officially confirmed in Wisconsin in 2013. 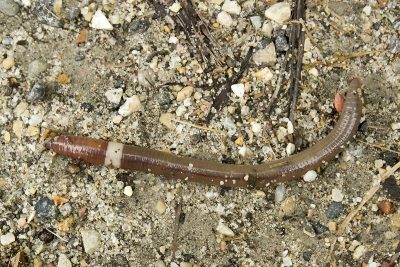 Jumping worms can rapidly consume the leaf litter in forests, lead to the loss of soil nutrients, and outcompete other earthworm species. Gardeners and homeowners are also concerned about jumping worms and potential damaging effects on their property. The Arboretum is collaborating with the Wisconsin Department of Natural Resources and the University of Vermont on a survey to determine how extensively these earthworms have spread in the state. Please complete the jumping worm questionnaire to help us learn where these new species of earthworms have spread. We especially welcome observations regarding changes in land cover and land use history in locations where jumping worms have become abundant. This survey takes approximately five minutes to complete. If you have questions about the survey, please email Brad Herrick.